Hacksaw Ridge embraces many of the clichés of the war movie but, instead of laying them out in a rote fashion, the film synthesizes them into a visceral, ultimately inspirational result. This is about heroism, patriotism, and an adherence to convictions - qualities that are increasing rarities in a society where self-interest has replaced self-sacrifice. Although Mel Gibson’s forte as a director is most evident in the battle scenes, he does just enough with the quiet, character building moments for the casualties of shells and bullets to represent more than faceless clones. Hacksaw Ridge opens by introducing us to two brothers - the wild and competitive Desmond and Howard Doss. (Strangely, this relationship, which initially appears to be a cornerstone of the film, is largely ignored after the first 15 minutes.) The boys’ father, Tom (Hugo Weaving), an alcoholic World War I veteran who, some 15 years after the 1918 armistice, suffers from a combination of PTSD and survivor’s guilt, is prone to violent outbursts. Following Pearl Harbor, both Desmond (played as an adult by Andrew Garfield) and Howard decide to enlist - a move the drives a wedge between them and Tom, who doesn’t want them serving. While Howard opts for a conventional enlistment, Desmond enters the army as a Conscientious Objector, intending to be a medic. Meanwhile, he woos Dorothy Schutte (Teresa Palmer), his Florence Nightingale, and promises to marry her on his first leave. The next segment of the film could be called the "An Officer and a Gentleman piece". It’s a generic basic training episode, complete with a gruff commanding officer, Sergeant Howell (Vince Vaughn), some hazing, and a little macho bonding. Desmond doesn’t fit in because he won’t touch a gun. This earns him the label of a “coward”, the ire of some of his fellows, and a Court-Martial. Eventually, with an assist from his estranged father, he gains the right to stay in the army as a Conscientious Objector and, when he arrives on Okinawa and participates in the attack on Hacksaw Ridge - a 400 foot high escarpment - he proves his worth. As a filmmaker, Mel Gibson has often been drawn to stories of heroism and self-sacrifice and he has never shied from unvarnished depictions of violence. (His The Passion of the Christ was criticized in some circles for its R-rated interpretation of Jesus’ crucifixion.) 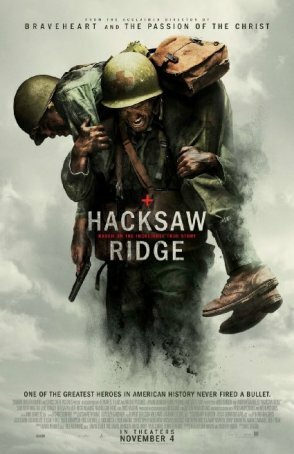 Although the first half of Hacksaw Ridge is unremarkable - a workmanlike but not spectacular establishing of characters, situations, and relationships - the movie hits its stride when the men of the 1st Battalion start their assault. The battle scenes are reminiscent of the Omaha Beach sequence from Saving Private Ryan. They hold nothing back with the horrors of combat being presented unflinchingly. Gibson expertly choreographs each sequence so that, although we get a sense of the bloody chaos that accompanies the fog of war, we are never confused about how the engagements unfold. Andrew Garfield, whose star has dimmed as a result of his association with the ill-fated Spider-Man reboots, is solid as Desmond. Teresa Palmer has the thankless “love interest” role. She doesn’t do much beyond providing Desmond with a reason to come home. Casting Vince Vaughn in the R. Lee Ermy/Lou Gossett Jr. role initially seems like a mistake - he’s a little too smug and lightweight during the “basic training” scenes - but he grows into the part and is actually quite good once he gets onto Hacksaw Ridge. Other participants include Sam Worthington as Captain Glover, an officer who initially berates Doss, and Hugo Weaving in a limited-but-affecting performance as the troubled elder Doss. Hacksaw Ridge is based on a true story. Desmond Doss became the first Conscientious Objector to win the United States Congressional Medal of Honor. The screenplay, credited to Andrew Knight and Robert Schenkkan, sticks as close to the historical record as the limitations of a two-hour movie allow. At the end, snippets of a 2006 interview with the real-life Doss (who died later that year) are shown. We are given an opportunity to hear his account of some of the events whose dramatization we have just witnessed. The movie’s verisimilitude is strong, although it’s more emphatic on the battlefield than away from it. Those scenes anchor Hacksaw Ridge in a specific time and place. One of the reasons why Teresa Palmer’s role is so limited is because, in the context of male-dominated combat, there’s no room for a woman. As a result, she appears only in the “home front” sequences. Hacksaw Ridge doesn’t have any rousing moments to rival those in Braveheart. That’s understandable because the heroism depicted here is of a more subtle kind. It’s about saving lives rather than taking them. It’s about avoiding fire rather than returning it. Viewers should be warned, however, that, like Saving Private Ryan, this movie doesn’t shy from showing what happens when high velocity round meets soft flesh. There’s more gore here than in an average horror movie. It’s not gratuitous but it is graphic. Perhaps this Oscar season is devoted to biopics of real life heroes. Hacksaw Ridge joins Deepwater Horizon and Sully in that category. (Depending on one’s perspective, The Birth of a Nation could also be considered.) Gibson has employed his considerable skills as a filmmaker not only to recreate one of World War II’s bloodiest battles but to highlight one person’s acts of selflessness that, although they may not have changed the tide of the war, resulted in many families being reunited with fathers, brothers, and sons instead of having to bury them.